While Mom was visiting, I wanted to show her around some of the neighborhoods in Toronto. While we were walking around The Beach, our tummies were rumbling. It was perfect timing when we walked right by Hogtown Smoke...the smell beckoned us and we walked right in for lunch. We got a perfect spot by the window so Wyatt could watch the cars go by. 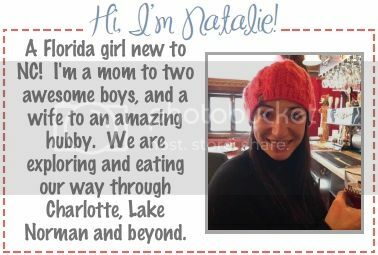 We both wanted to devour the whole menu, but decided to order sandwiches since it would be "less food", ha! While we were waiting for our meals, I eyed up the sauces on the table. 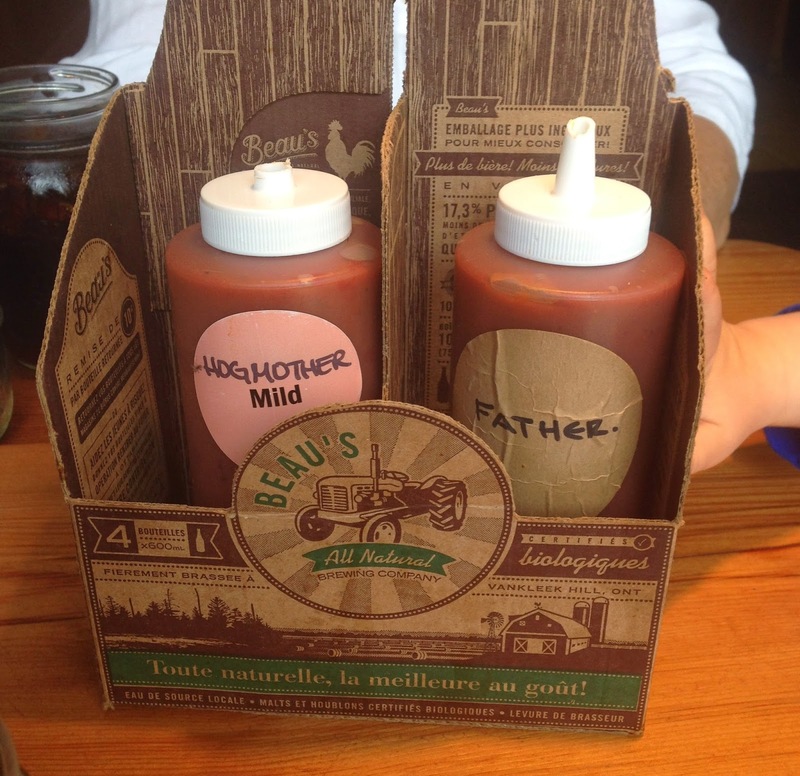 First their signature sauces, Hogmother (milder) and Father (spicier). I personally didn't find that much of a difference in the heat level. Both were tangy, well spiced, and a little sweet. The father just being a little higher on the heat scale. 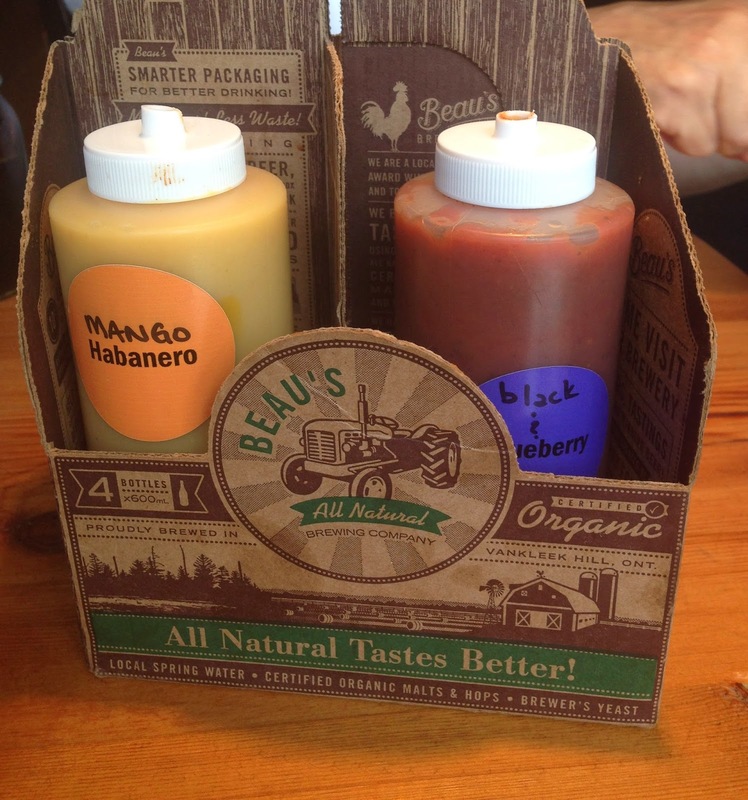 The two I didn't try were the Mango Habanero (way spicy!) and the Black & Blueberry (sweet). I'll have to check those out next time! Huge plates of food were coming our way, and I couldn't wait to take a bite. My meal was the Brisket Sandwich. Their signature meat was served on a nice fluffy bun. The 18-hour smoked brisket was smoky, succulent and fell apart as I was picking some for Wyatt. 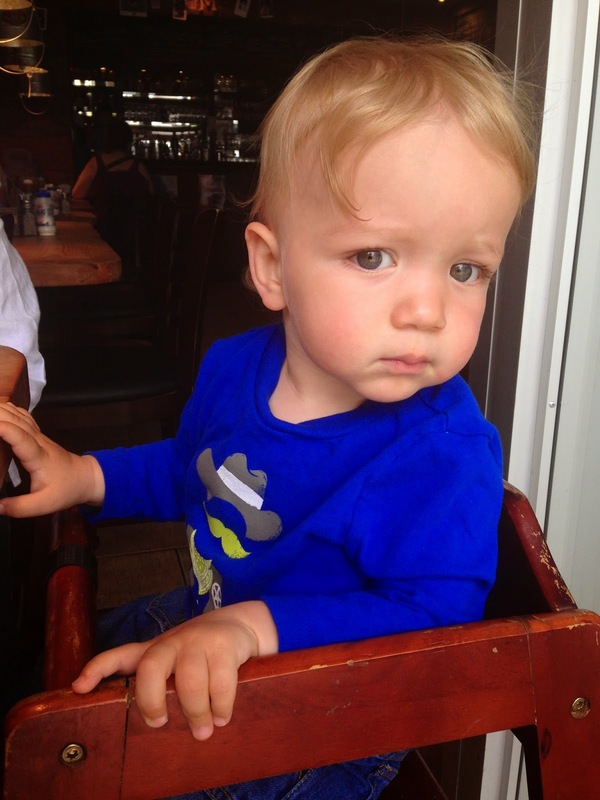 My non-meat loving son (shocker I know!) even liked it. One of the sides I chose were fries. Look at that gigantic mound of fried taters! My only wish was that the fries were crispier. My other side was the chili. It was a couple dollars more as an upgrade, but worth it! 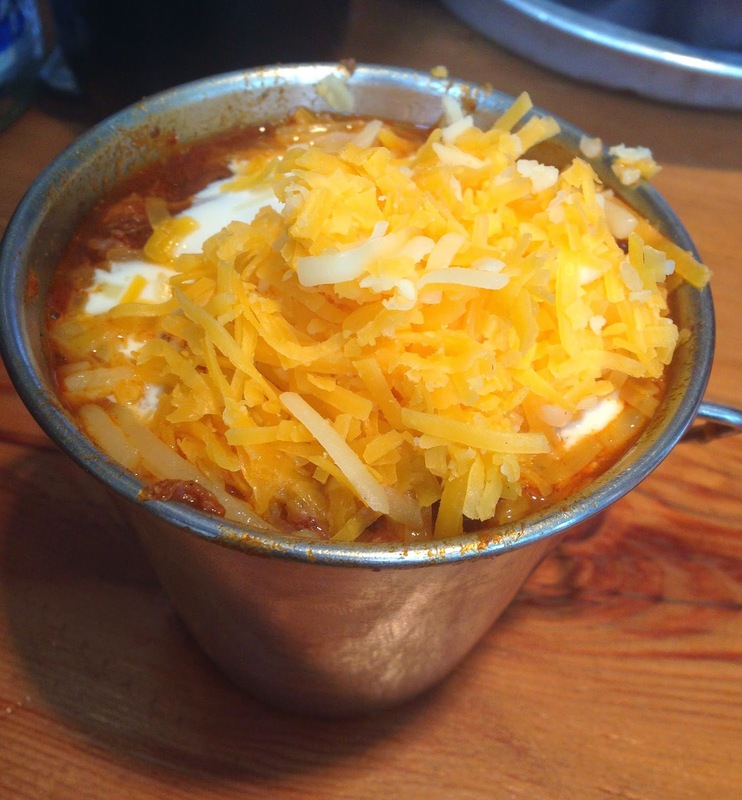 It was pork and brisket chili goodness topped with cheese and sour cream. The picture doesn't do it justice. 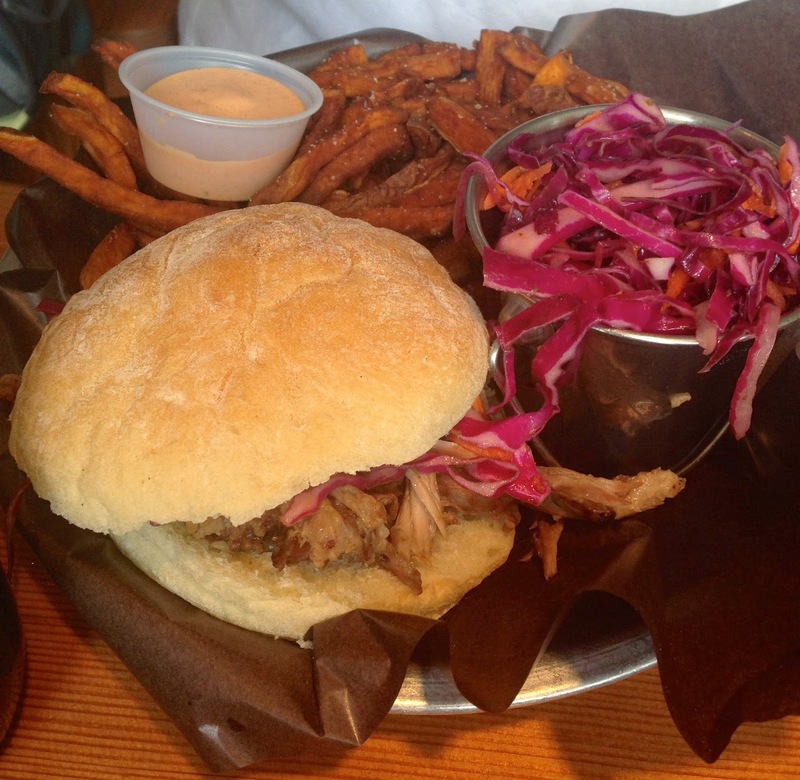 My mom got the Pulled Pork Sandwich with sweet potato fries and vinegar slaw. The pork was tender and delicious. After eating almost all my sandwich and maybe getting through 1/3 of my sides, I knew it was time to throw in the towel. My stomach couldn't handle any more food! Luckily we walked a couple miles afterwards. Maybe I burned off a few bites of chili? I can't wait to bring the hubby to Hogtown Smoke, he sure loves his meat! What is your favorite barbecue meal? This all looks delicious! I love bbq! And that chili looks great!